w.w.e.d.? : this makes me feel a little better. there's a story behind this... last weekend matt and i went to the macau grand prix, a car race that takes place on the city streets of macau. the races got pretty loud - loud enough for me to use ear plugs. i was getting nervous that the loud cars would hurt my unborn child's ears, so i started wrapping my arms around my belly or squatting everytime the machines would race past us (i'm sure i was a sight). once i got back to our apartment and my best friend google, i started "researching" whether or not i had just deafened my eggroll. 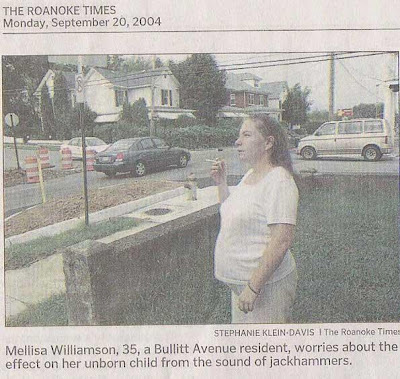 as usual, google afforded me a plethora of answers so i could believe basically whatever i wanted to, and it also scared up this picture and caption of another expectant mother, concerned for her baby's hearing and well-being. girl, i'm totally feelin' you... but you just take another long drag on that cigarette honey; that will make everything all better. I did the same thing as you! When I had about 3 months left in my pregnancy, I had to spend 3 weeks touring an Air Force Base for my job. I spent a lot of time out on the flight line where the noisy F-15 aircraft were taking off and I would cover my stomach, thinking that the loud noises were going to make my baby deaf. I spent my nights in my hotel room Googling the adverse effects of the loud noises and the radar that I had been exposing my baby to. I freaked myself out, but really had no need to. She was born just fine and passed her hearing test with flying colors. I am a huge Googler myself and I worried way too much about things when I was pregnant. Just remember that eggroll is in a huge pillow and the loud noises bother you way more than him. oh my,oh my, oh my... that needs to sent to Jay Leno's headlines....yes yes it does... and you're too cute, concerned about little baby boy--you're on the way to being a superb mom! you crack me up erin. i can just see you squatting to increase the fluid around the little fellas ears and all. when i was 6 mos preggo with grayce, i got a delightful electric shock from an uncovered outlet. she didn't move for about 12 hours after that and it took a lot of kool aid to get her to move too, maybe that explains the craziness of grayce?.?.?. that's hilarious! right when i was feeling as if i was the dumbest pregnant chick to walk the planet, you show me this. i'm comforted. thanks. I love this. I giggled when I saw the news story and then I cracked up laughing after reading your story behind it. You are awesome!